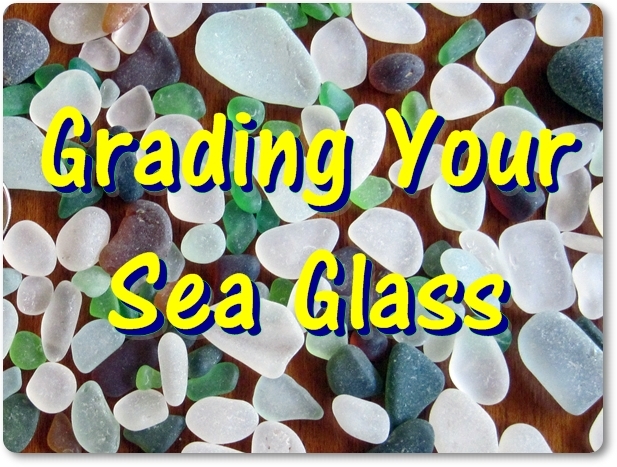 Have You Been Wondering How to Grade Sea Glass or Beach Glass? 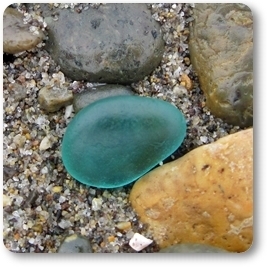 When you're walking on the beach and spot a piece of sea glass, you first notice the color. Bright colors really stand out and are very exciting! On the other hand even a dull-looking piece may turn out to have very attractive subtle colors. With experience, though, right after remarking the color of the glass you'll look at the grade of glass before getting too overjoyed. 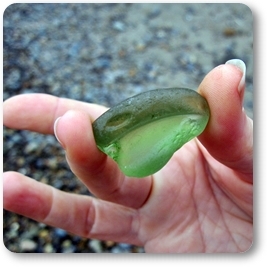 A piece of sea glass that is not very frosted or is chipped or broken can lower not only our excitement level a bit but also the grade and perceived value of that beach gem. Take a good look at the two pictures above. 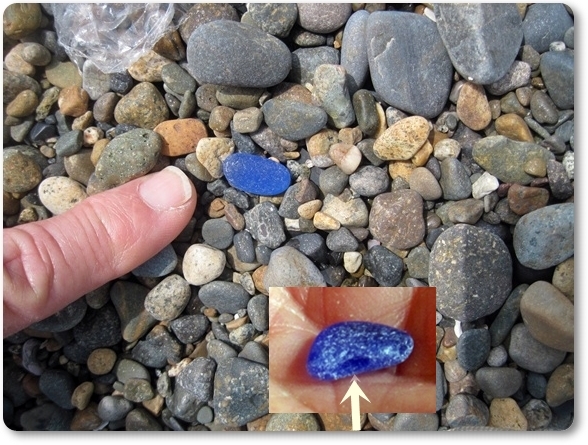 It takes a long time for a glass shard to become a rounded and frosted jewelry grade. 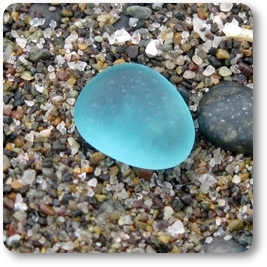 Therefore, jewelry-grade glass is much rarer than craft grade. 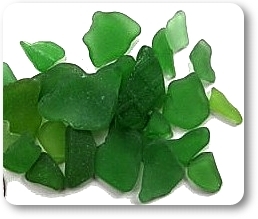 Most fine sea glass jewelry is made with Jewelry A sea glass. Of course, that doesn't mean that craft grade cannot be used for jewelry or vice versa. 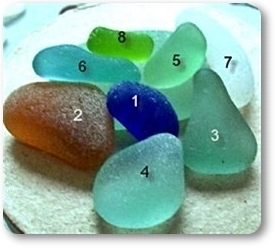 However, the very rounded and naturally-symmetrical look as well as the evenly-frosted surface makes Jewelry Grade A sea glass a natural for jewelers. Here are two views of the same numbered pieces from two different sides. Notice the features. 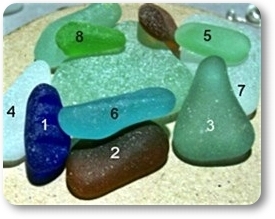 You will notice that pieces #2, #6, and #8 have some edges not quite as rounded. If they were a little sharper, they would fall into a Jewelry B grade. You will notice here that #1 and #4 have obvious chips. However they are the only defects and are visible from one side only, and so qualify as Jewelry Grade B. Pieces #2, #3, and #5 don't have any visible chips.However, the edges are a little too defined to be Jewelry Grade A. 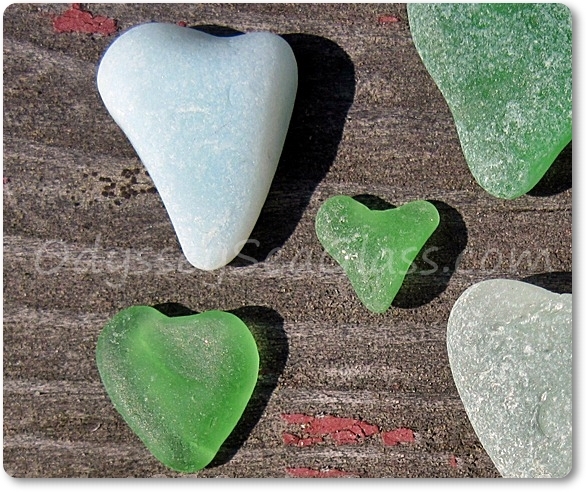 This category might include, for example, the sea glass hearts group above. Good for many art and craft projects. May have chips, defects, and rough edges. Good for mosaics and some craft projects. 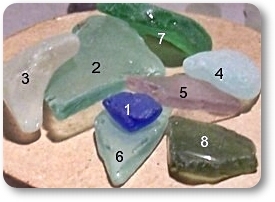 You can see that the above mix of Craft Grade A and B sea glass is much less rounded and tumbled than the Jewelry grades. Pieces #1 and #2 are Craft Grade B. 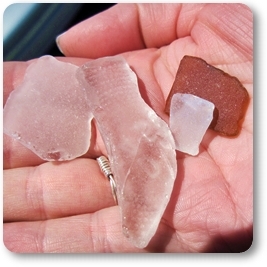 Pieces #3 and #4 are Craft Grade A, being fairly well tumbled and smoothed but with distinct edges and some chips. Pieces #6, #7, and #8 are actually somewhat shiny. 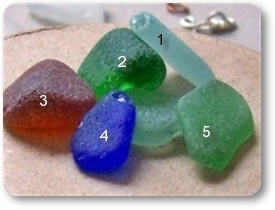 Along with piece #5, they barely meet the standards to be considered sea glass. 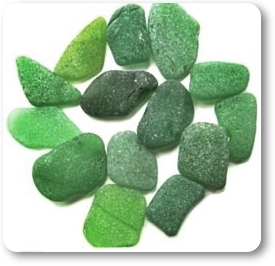 However, the colors are not so common so you would likely want to keep them in your collection until replaced with similar colors that are in better tumbled condition.